(10 ppl or more)As Entree: Mushroom Guisada (mushroom with fresh green peppers and onions in a red Creole sauce) or Baked Chicken (rotisserie chicken, lime juice, green pepper, onions, oregano, vinegar, cilantro, garlic and black pepper) Served with a Green Salad with lettuce, tomatoes, seasonal vegetables and avocado with light vinaigrette on the side with a side of Black Beans and Rice. (10 ppl or more) As Entree: Chopped and grilled mushrooms or marinated, shredded and pulled chicken. As Side: White rice. Sauces: Jalapeno and tomatillo salsa or sun-dried red chili salsa. As Toppings: Corn taco tortillas, refried beans, lettuce, cheese and sour cream. This chic and comfortable meeting room in Manhattan will make you and your guests feel instantly at home. Using reclaimed wood and beautiful antique traveling trunks, this meeting room rental will give your meeting a real taste of Americana. 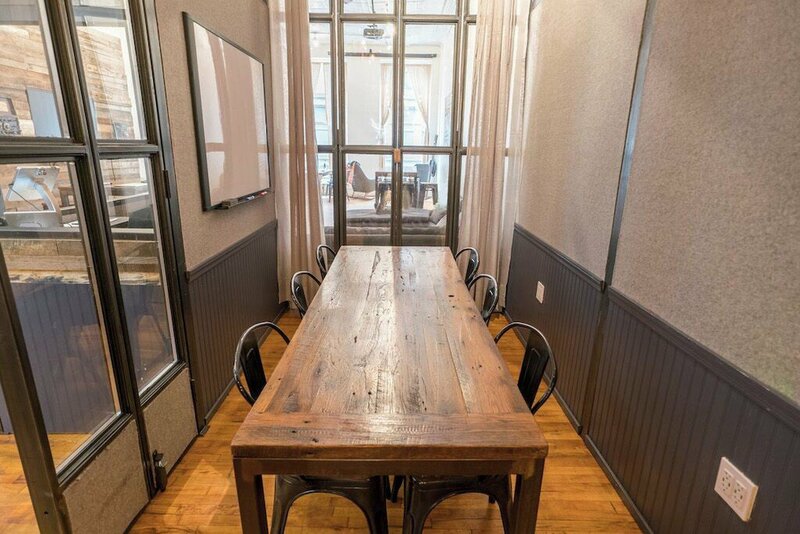 You’ll find that work is a breeze in this NYC meeting room that lets light flood in through the tall glass windows. Your pocket will be happy too, as this space offers one of New York’s most affordable deals in a premium location. Located in a popular coworking space, your meeting will have a young and laid-back feeling while still being intimate enough to discuss private matters. With seating for up to 6 guests, the trendy meeting room works well for smaller conferences, corporate strategy meetings and all types of team meetings in general. This Soho meeting room has the perfect balance between an open format and a private room, which makes it a great fit for more traditional professionals as well as hip, young meeting-goers. When you rent this meeting room it also comes very well equipped with a flipchart, projector, screen, whiteboard, metaplan board, pens, paper, microphone, television and music system all included in the hire price. Coffee, tea, water and lunch can be added at extra costs. Located in the heart of Soho, all your guests will find this meeting room rental very easy to reach. With public transportation, lines A, C, E, J, N, Q, R, W, Z, 4 and 6 will take you quickly to the venue. This meeting room in Manhattan provides countless great restaurants, retail stores, and cafes to enjoy during break time. 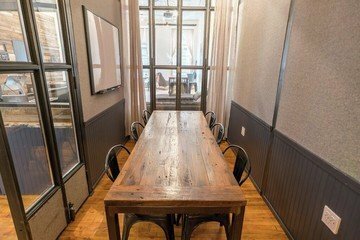 Any out-of-town meeting goers will definitely enjoy Broadway street, situated very close to this meeting room for rent (and native New Yorkers are sure to enjoy it as well)! Bonjour, je m'appelle Theo Heinis.